Baronius Press is a Catholic book publisher originally founded in 2002. It takes its name from the Venerable Cardinal Caesar Baronius, a Neapolitan ecclesiastical historian from the late 1500’s. The main objective of Baronius Press is to raise the quality of Catholic books in order to make them more appealing to a wider audience. Baronius Press is one of the few remaining publishers to produce beautifully bound titles. In an age of mass production and cost cutting overriding aesthetic beauty, Baronius Press is reversing conventional wisdom. 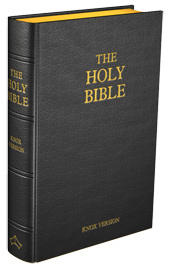 Our edition of the Knox translation of the Bible, is no different, and is produced in a beautiful and lasting binding, which reflects the sacred text that it contains. Care and attention to detail mean that the exquisite finishing touches such as headbands, ribbons and marbled endpapers that most other publishers just simply can’t afford to offer are insisted on. The time and effort that is invested into each title is enormous, but this is a small gesture of love for the treasures of the Holy Mother Church whose literary treasures Baronius Press publishes for all generations to endear. Discover the fundamental features that make the Knox Bible exclusive. The hardcover edition uses leather covered over 1/8” thick, stiff boards to create strong and durable book that will last for generations. This is then carefully blocked on both the spine and the front cover with the title “The Holy Bible”. Ribbons are excellent for referring to different sections or to note the point which has been read, so are standard on all books. For the Knox Bible, special ultra soft ribbons that are designed not to damage the gilding (a common problem with gilded books) are used. In times gone by, paper was of such a poor quality, that gilding the edge of the book was a way to prevent light and humidity from breaking it down even faster. Today gilding is more decorative and is mainly used for sacred works. The Bible edges of the paper have been gilded to the highest standards possible for the most beautiful finish possible. Headbands originated in Victorian England as a way of covering the unsightly spine sewing at the head and tail of the book block (hence the name). At one time popular with publishers, but due to cost are less used today by trade publishers. Baronius insists on these small finishing touches and so the Knox Bible has gold head and tail bands to match the gilding. The endpapers are made of thick heavy-weight paper, decoratively printed with marble motive to complement the overall design of the book.